Wild nature combines with artistry and design. 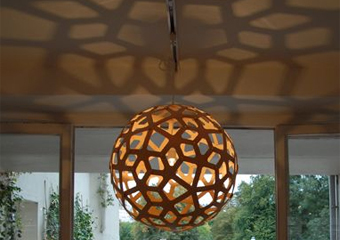 We are thrilled to bring you the brilliant, contemporary lighting designs of acclaimed New Zealand designer David Trubridge! Derived from the structure and patterns of nature and a deep passion for the landscape, his original designs reflect a breezy, sophisticated flavor of the South Pacific. Sensitivity to the environment is paramount throughout his design process, and that sense of care is imbued within the objects he creates. 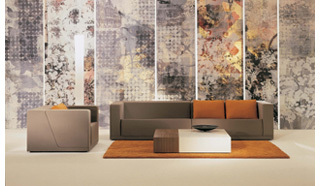 The results are authentic and enduring, achieving maximum effect with minimum materials. We recently launched exciting new designs from perennial favorites F!NK + Co, Lump Sculpture Studio and David Edmonds at the winter New York International Gift Fair. Fantastic New Designs From F!NK + Co.! Great news! We are now bringing you two additional spirited and innovative Australian designs. Both are playful and distinctively F!NK + Co. The Creamer + Sugar Set strikes a sublime balance between technical innovation, distilled form and functionality. The three-piece set perfectly enhances the ritual and pleasure of serving tea or coffee. The playful design of the Creamer elicits the surprise of a bottomless container and the Sugar Bowl is ideal for serving cubes or granules. An extension of F!NK’s exhibition pieces, the soft lines of the Sushi Set challenge the perception that metal is a hard and static form. The gentle undulations create a sense of flow and movement like rippling water. The sensual nature of the shape complements the Japanese art of aesthetically displaying the beauty of the prepared food. The Water Jug is F!NK’s signature designs and remains one of our best sellers. 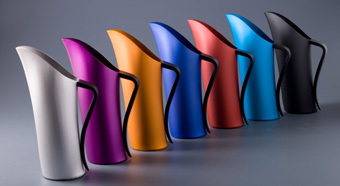 It is available in six stunning anodized matte colors – and in silver with a lustrous satin finish. It is perfectly complemented by the F!NK Beakers and Tray. Introducing Bauple, Wax, Gobble & Frag! in the Husque collection, created by one of our favorite designers – Marc Harrison. Like the original Husque bowl, the vessels’ forms are inspired by their distinctive ingredient – the Macadamia Nut. 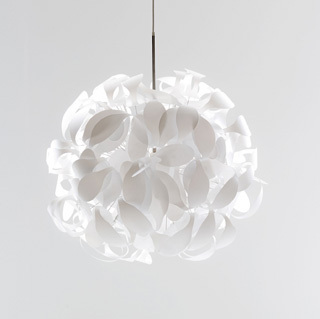 The expanding range broadens the vocabulary of shapes available, from the spherical whole nut to geometric broken shells. Playful Bauple bowls, available in two sizes, represent smooth rounded halves and are the perfect accompaniment to the Wax serving platter. Wax’s form is reminiscent of early Bakelite castings which inspired the creation of the Husque composite material, and features rounded corners and molded feet. 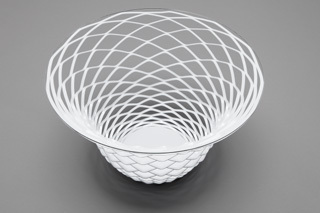 The edges of the striking Gobble bowl are thick and faceted with three points, and it is available in two sizes. The elongated Frag platter creates an original centerpiece for any setting and takes its inspiration from narrow shards of cracked shell. To request a wholesale price list, please contact us. 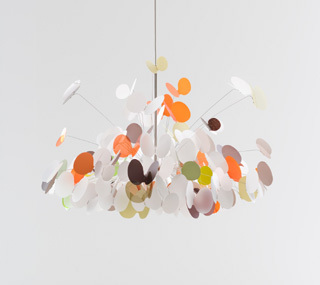 With the addition of the Xploff and Acacia designs, we are delighted to offer Marc Pascal’s complete series of kinetic lights featuring imaginative shapes poised on tensile stainless steel wire. Made of polycarbonate, stainless steel and resin, each piece is one of a kind with color-ways customized to client specifications with the added touch of Marc’s imagination. All of Marc’s designs share a modern mix of elegance and play, and create a fabulous impact in both residential and commercial settings. Xploff captures the explosive impact of the big bang! Elliptical discs race outwards, caught in a moment of time, bursting into a joyful array of light. 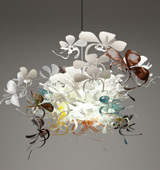 The Acacia light is inspired by the incredible hallucinatory qualities of the medicine plant. Twisting, turning and tumbling in on themselves, the seed pod shapes wrap around in a continuous flow of light imbued energy. If you would like a copy of our recent wholesale price list or to place an order, please contact us . 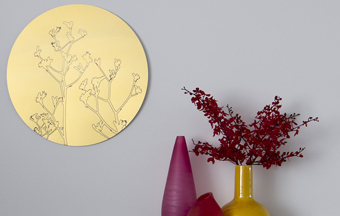 Designs abroad is thrilled to bring the gorgeous works of Spacecraft studio to the US market! Spacecraft’s founder, Stewart Russell, is a man of many talents – contemporary artist, textile designer, curator, mentor, and collaborator; that is inspired by defying classification. We carry two series of printed works on canvas from his Melbourne-based textiles company, Botanical Paintings and Backing Cloth Paintings. The Botanical Paintings series features Australian flora (flax, fennel and peppercorn) in a range of graduated colour schemes with shimmering metallic details. They are available in multiple sizes to suit a variety of spaces and price points (shown below are from left to right fennel in black, peppercorn in green and flax in warm grey). 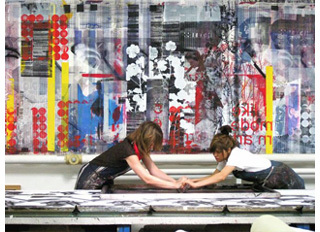 The Backing Cloth Paintings are unique works derived literally from the backing cloth of the studio’s experimental project table. Ideas, tests, even sketches accumulate on the canvas over an eight week period. Once saturated, the backing cloth is divided and cut into individual works of art to share with the public. They are available in a standard assortment of sizes. Fortunately, we have a fresh batch of Backing Cloth Paintings to bring to you every eight weeks that captures the brilliant evolution of Spacecraft studio! Both Spacecraft’s Botanical Paintings and Backing Cloth Paintings can be customized for commercial projects such as hotels, serviced apartments and corporate offices. Shown below an international corporate headquarters, where a series of floor to ceiling customized Backing Cloth Paintings adorn the foyer. We are thrilled to unveil the newest addition to our collection of outstanding Australian brands – Ute Australian Design by Kain Lucas! create beautiful and practical Design that works™. the method of manufacture. Two short years after Ute’s inception, Kain Lucas has been short-listed for the prestigious Bombay Sapphire Design Award for his striking series of Victoria Tables. 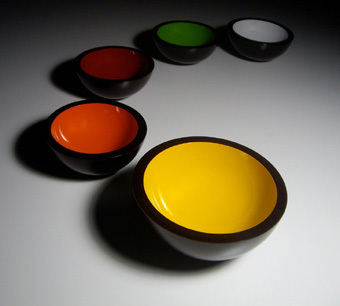 Bowlboard was designed specifically for food preparation and has four bowls inlaid flush to the surface of the board. The board is made of mold-resistant carbonized bamboo and the bowl material is durable food grade melamine. The Bowlboard makes food preparation enjoyable and doubles as a terrific serving piece for appetizers and dips. 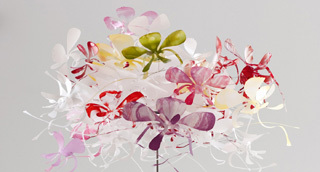 From the unique mind of Mark Pascal comes the exotic and playful Orchid Lamp, the fourth in a series including the popular Eyoi yoi design. 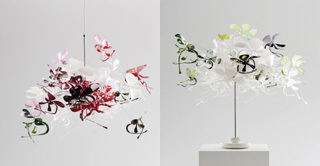 Each lamp is hand-crafted in Pascal’s Melbourne studio using polycarbonate and stainless steel wire. The tensile stainless steel wire gives life to the individual fronds of the lamp, capturing the mysterious and stunning qualities of the wild orchid flower. 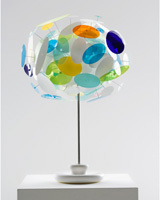 Each lamp is hand-made and dyed and can be customized to your taste, producing an individualized mix of colors and shapes. The intricate bouquet-like design can be admired both lit and unlit, giving you a stand-out piece of art, combining functionality with imaginative beauty. A spectacular statement piece that is sure to make you smile even on the greyest of days! Inspired by the relationship we have with the world around us, Rachel Bowak created F!NK + Co.’s Antipasto Set to reflect the colors, shapes and textures of the eclectic Australian landscape. The smooth lines and bold colors of the individual pieces come together to create eye-catching contrasts to show-off any number of culinary delights. Combine your stainless steel platter and anodized trays together for the perfect antipasto presentation or use individually to hold sauces, dips or sweets. The options are endless! This versatile set is the epitome of modern design excellence, which can be enjoyed both as a work of art and to brighten any dining and entertaining experience. 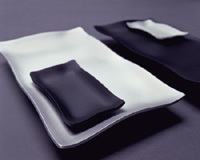 The silver platter is available with charcoal, blue, green and orange trays. Enter your email address to subscribe to these news letters and receive notifications of new posts by email.